This article is about the snowtrooper officers affiliated with the First Order. For the snowtrooper officers affiliated with the Galactic Empire, see Snowtrooper Commander. The First Order Snowtrooper Officer is a Star Wars minifigure released in 2015. 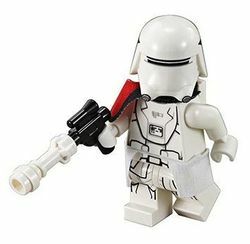 The First Order Snowtrooper Officer minifigure has a white leg piece with black and grey printing. The black printing is used to outline the boots and the bottom of utility pouches on each leg, as well as the belt which appears on the leg joint. The grey printing is used for detailing the more flexible area between the knee and upper thigh. The officer's upper body piece is all white, but features printing on the front and back of the torso area. The back printing consists of a backplate outlined in black and the beginnings of straps on the lower part of the backplate to connect to the front of the armour on each side. A small amount of grey detailing is also present inside the plate. The front features chest plating outlined in black, with the two straps continuing on from the back plate on each side. The tops of the utility pouches are also printed on, continuing from the leg printing, and each pouch as some grey detailing towards the top. The chest plate has grey and dark grey lines inside it for extra outlining, including a dark grey neckline. Near the bottom of the chest plate is a rounded rectangle outlined in black, which has black and dark grey shapes inside, and above this rectangle, some grey shapes are present. The Snowtrooper Officer's head piece is plain black with no printing, but comes with a white helmet piece specially moulded for this type of trooper which has black and dark grey printing for features such as the visor. This minifigure also comes armed with a blaster which is made out of a black blaster pistol piece with a white piece commonly used as a lightsaber hilt attached on the end. The officer also come with a white cloth kama which is attached between the legs and upper body pieces, and a backpack which is made up of two pieces- a black bracket which is attached between the neck and the head, and a white 1 x 1 tile which is printed in grey and black, depicting an armoured backpack. Lastly, the Snowtrooper Officer has a cloth black and red officer's pauldron, which is also attached between the neck and head, and worn over the right shoulder. 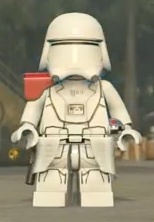 The Snowtrooper Officer in LEGO Star Wars: The Force Awakens. First Order Snowtrooper Officers were a stormtrooper variant who served the First Order and commanded groups of First Order Snowtroopers. The snowtroopers had insulated armour and helmets designed to reduce glare in icy terrain, allowing them to operate more efficiently in cold environments. Facts about "First Order Snowtrooper Officer"
This page was last edited on 6 July 2016, at 09:01.